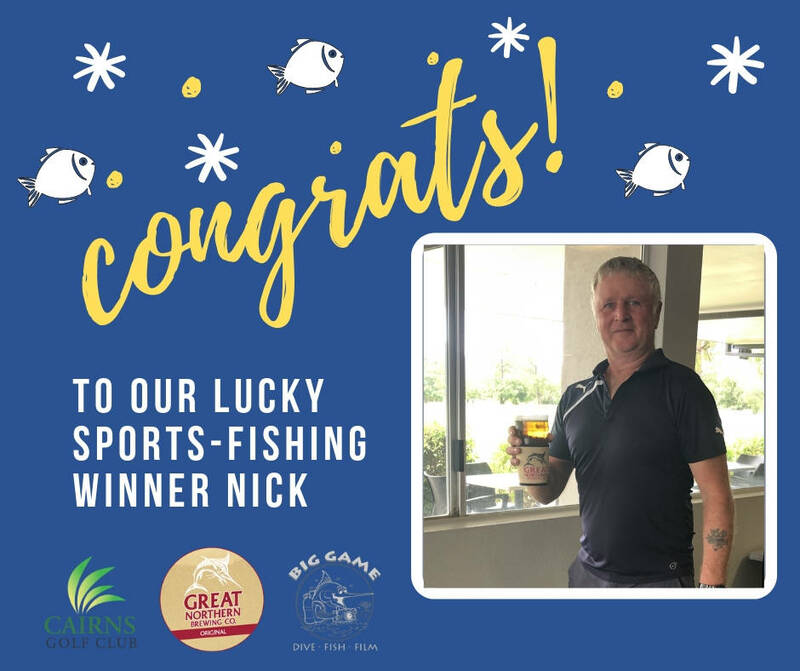 While the wettest Summer in 40 years doesn’t seem to be slowing down, there has certainly seen plenty of activity around the Club, even though we haven’t been seeing too many faces lately. Many of you may already be aware that our Director of Golf Jason Roach took out the PGA Club Golf Professional of the Year at the recent Qld Golf Industry Awards. 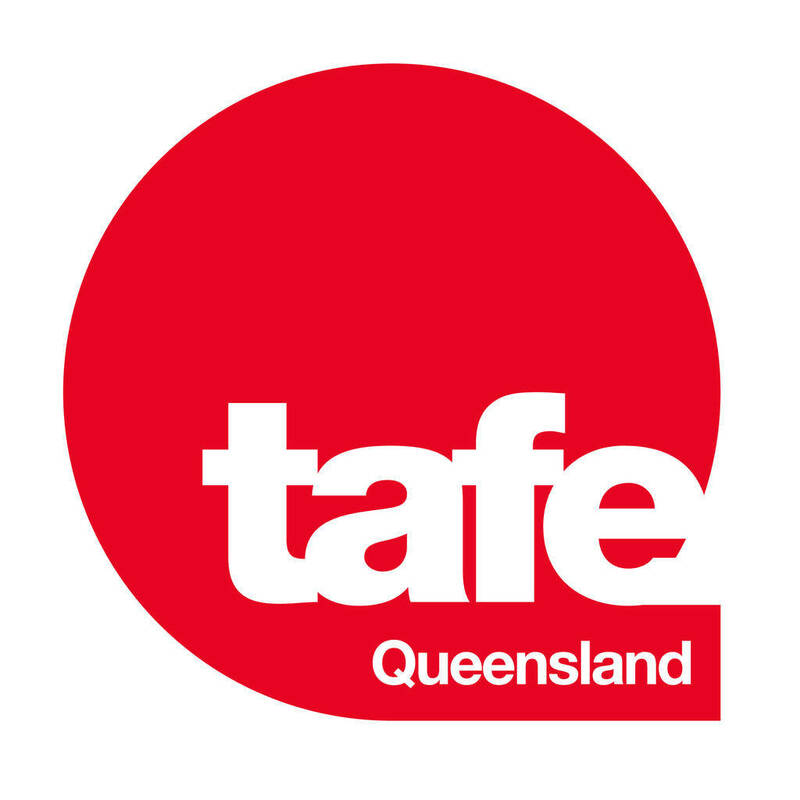 The award is a massive achievement and is recognition of a lot of hard work over many years. Make sure you give Jason a pat on the back next time you see him and check out the snazzy new plaque on the wall in the Golf Shop. The big final push has been on in haste this week to finish off the kitchen works. Its been a pretty decent exercise replacing the asbestos flooring and ceiling over the past 6 – 8 weeks. We’re very happy with the finished product which will serve the club well into the future. The works were funded by a $35K Community Gambling Benefit the Club received last year. We have also secured a tenant for the Kitchen, who in time, will be looking to restart the Friday Night Dinners and Sunday Brekky type events. More information to come in the coming weeks on this exciting news. The Driving Range Net replacement program is now complete. Earlier this week, while dodging the heavy showers the contractors managed to get the last of the Nets installed. It certainly hasn’t been a cheap exercise but with initial support from The Wednesday Sporters crew who purchased the bulk netting, the Club has been able to fund the project over the past 2 years. This Sunday we are hosting the regional final for the Volkswagen Scramble. 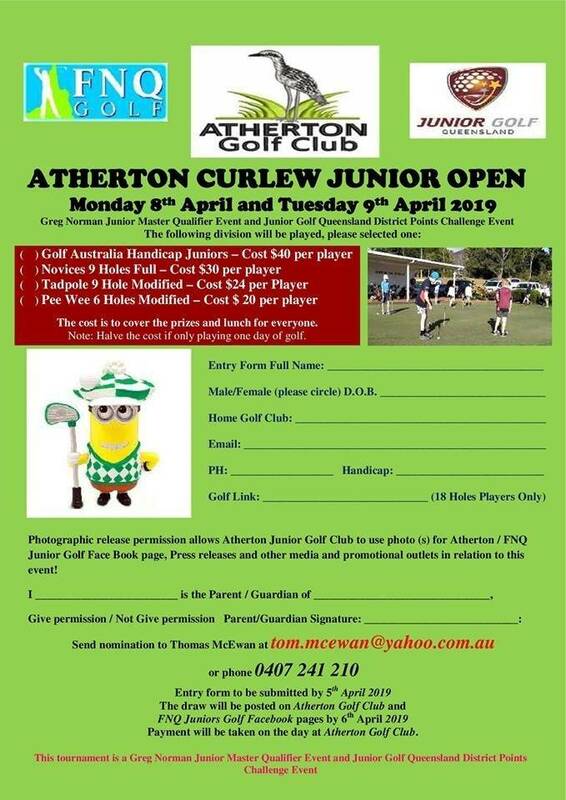 Clearly the players involved will not see our course at its best with all the recent wet weather, but it is a feather in our Club’s cap to be able to host the event for the first time in recent memory. Good luck to all players involved and hopefully the Sun comes out to improve playing conditions. It was a sad day for golf last week with the closure of Paradise Palms on Sunday. Making ends meet while running Golf Courses is incredibly difficult and I fully understand the ownership groups decision to close the course. There’s been a little bit of unfair criticism around the decision to close but I can understand how PP Members would feel seeing their beloved course no longer operating. For those interested we’ve only had about 15 PP Members join CGC and as expected the closer location of HMBGC, has seen more PP Members join with approx. 35. I also expected quite a few to head north to Port Douglas and possibly join Mirage or Palmer Sea Reef. For the record, CGC President and myself whipped Half Moon Bay GC’s Manager Greg Ferry and member Peter Fox in a game earlier in the month to say goodbye to Paradise Palms. We’ve had a big tree come down recently on the right hand side of the 2nd fairway. A smaller section of the same tree came down a few months ago and cost $800 to remove by specialists as it was simply too big for our crew. Once the ground dries, we’ll be up for a much bigger amount as this tree is huge! Nominations are coming in thick and fast for the Schweppes Cairns Open on May 4th and 5th of the long weekend. 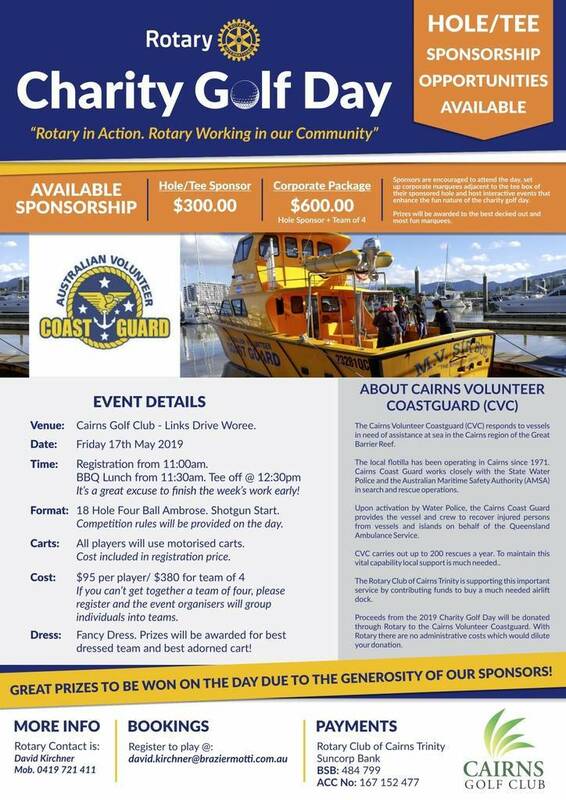 It’s going to be a cracker weekend with the club hosting the very popular “Cairns on a Fork” food festival on the Driving Range on Friday 3rd of May to kick off the event. We expect approx. 2000 – 3000 people to attend so keep an ear out for more information as it comes through. We’ll have more big announcements coming soon too in the lead up to the event. Big News out of our Golf Shop too with PGA Pro Rob Dehne accepting a Director of Golf role at Darwin GC. 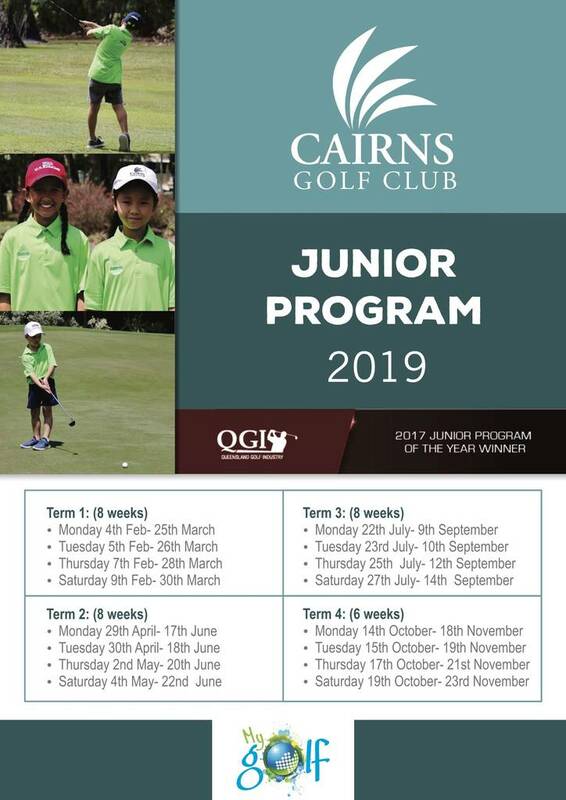 It’s an awesome career opportunity for Rob and his family and on behalf of the Staff, Board and all Members of Cairns Golf Club thank you for your efforts over the past 6+ years. Rob has done a fantastic job with our Ladies Lets Golf program and a number of other areas around our club. We’re all obviously sad to see Rob, his wife Maili and their young fella Hunter leaving the CGC family but wish them well in the Northern Territory. Rob’s last day will be Friday 26th of April and we’re currently exploring a number of scenarios looking for a replacement. Can somebody stop it from raining please??? Hope to see you Round the Traps! 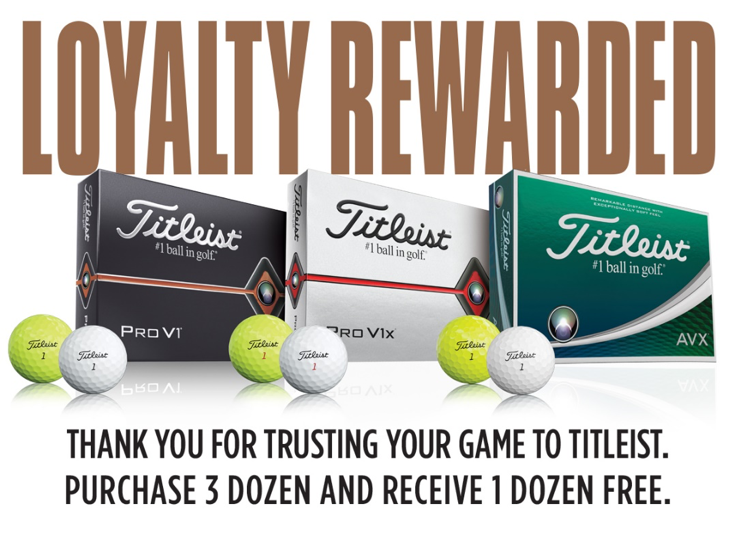 Come in and see the friendly staff in the golf shop for this amazing deal personalised golf ball deal from Titleist. Offer ends 29th April 2019. Terms and conditions apply. See in store for details. Well done to the CGC ladies who won the Interclub day at Mareeba Golf Club. A fantastic effort for our women who have come home with the chocolates for the first time in a while. Congratulations to all players involved and good luck for the next round!! You will notice the “Penalty Areas” markers (red stakes) have changed slightly on the left hand side of holes 1 and 14. Please familiarise yourself with these next time you play. The match committee is reviewing all penalty areas around the course to make the decision making process more simple in regards to lost balls etc. 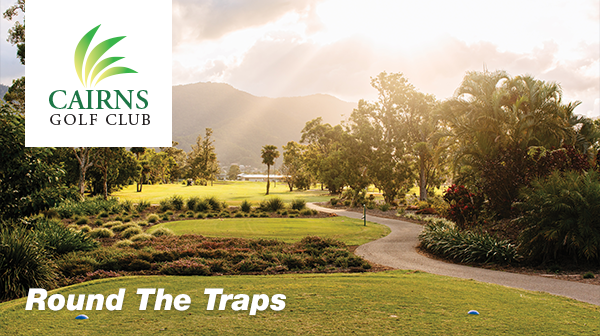 The Cairns Golf Club match committee has not introduced the stroke and distance rule in regards to Out of Bounds. This decision, along with other rules were discussed in match committee meetings and it was decided we would hold off with the change currently (many other clubs have decided to also do this). We have decided to review this decision for 2020 and see how it has influenced positively or negatively towards the club and playing members from the clubs that have trialled this local rule. So currently, if your ball is out of bounds, you will be required to play from the original position with penalty. 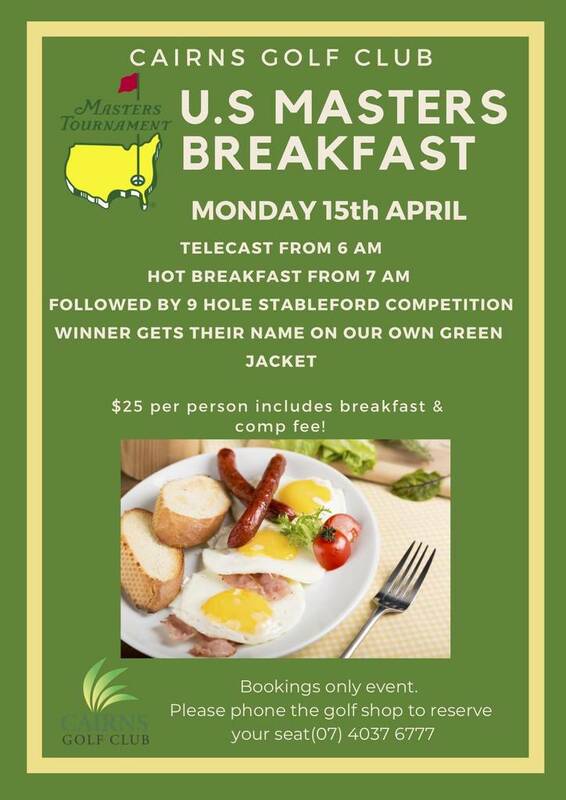 The Masters breakfast is fast approaching again at the Cairns Golf Club on Monday 15th April. Can Michael Court go back to back and become the CGC masters champion again? Telecast is from 6am in the clubhouse with a hot breakfast from 7am. 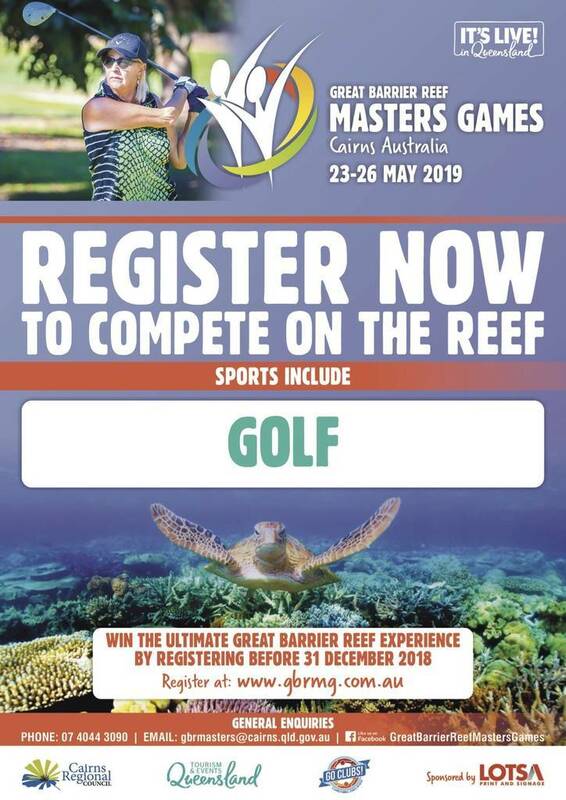 A 9 hole Stableford competition will take place at the conclusion of the final round of the US Masters with the winner to get their name on Cairns Golf Clubs own green jacket. The next installment of the 4x4x4 will take place on Friday 12th April from 4pm. Due to the success of the event, we have increased players numbers with the event to stat half an hour earlier. We have had two full fields and the events have been successful with lots of laughs, interesting choices of clubs and the uses of the mulligan. You are required to play 4 holes, use 4 clubs only and you must take 4 mulligans. We will have happy hour and presentations at the conclusion of play. 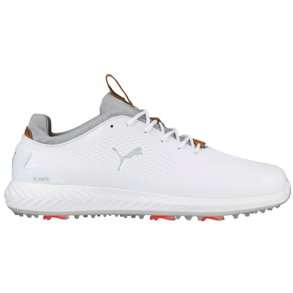 Bookings can be made online or by calling the golf shop on 40376777. 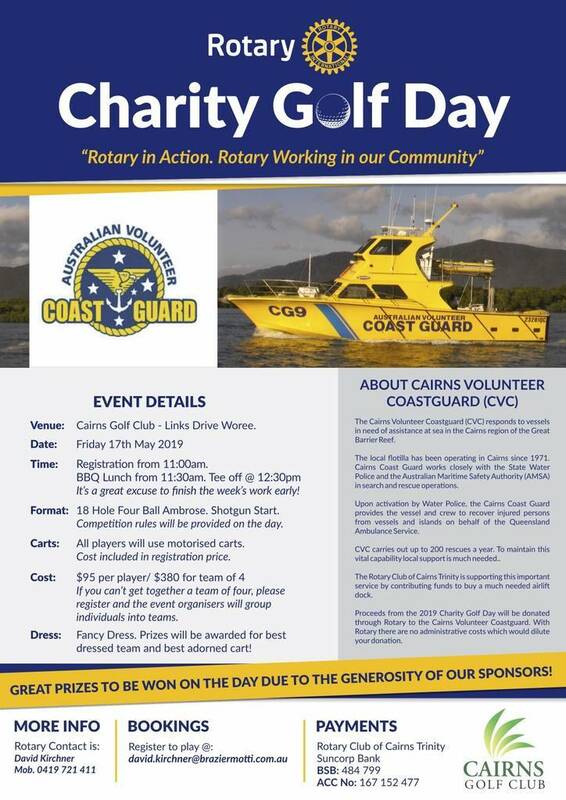 Spots are limited so get in fast for a fun Friday afternoon at the Cairns Golf Club. 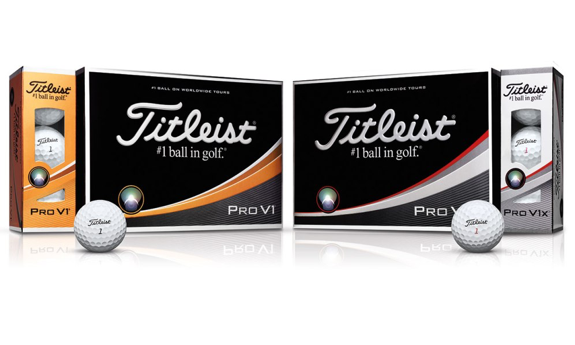 Fantastic daily Men’s & Women’s Prizes plus overall prizes @ the last round. Well done to all players in making a conscious effort in the competitions to ensure an acceptable pace of play. We have received much positive feedback in regards to the improved pace of play from members and visitors. Whilst we are not perfect we are heading in the right direction as the average time taken to play has come down significantly. 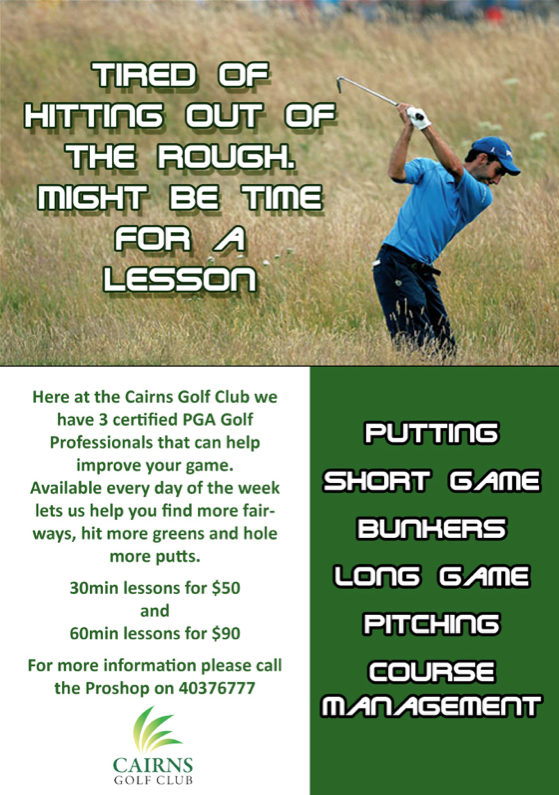 The Cairns Golf Club Pace of Play Policy (POPP) is now in place and has been developed for the betterment of the club and the enjoyment of your game (nobody likes a 5 hour game). We have allowed 4 weeks’ notice in December and 6 weeks grace in January/February. Penalties will now be given if it is found a group has breached the POPP. With increased members and player numbers in each competition, it is important your group makes a solid effort to play in an acceptable time and get to the tee on time. It only takes one group to slow down the entire competition field and I have heard every excuse under the sun as to why their group was slow (there are no excuses) but it is up to the lowest handicapper in the group to ensure the speed is acceptable and act as the captain. 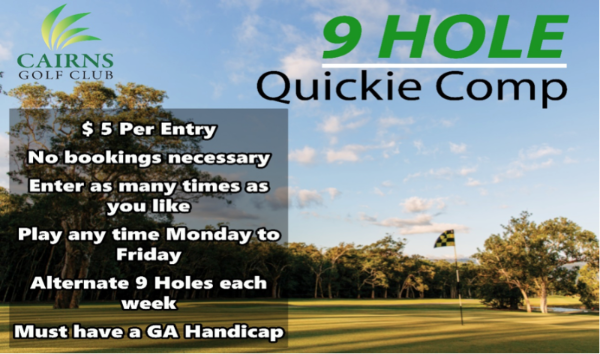 We have groups that have higher handicaps still completing the round in 4 hours and 10 minutes on a Saturday so it can be done if every group kept up to each other. I do understand it is warmer but all groups are playing the same course and conditions. Marshalls will be on course to keep an eye and ensure the speed is acceptable and the enjoyment of everyone’s game. Pace of Play not just at our club, but nationally is a problem and its one we are all looking to improve. I thank all groups that have being doing the right thing and making a conscious effort. Please familiarise yourself with the POPP document below to help fix this problem. We have a heaps of new stock in the Cairns Golf Shop from many of the major companies like Callaway, Taylormade, PING, Titleist and Mizuno. 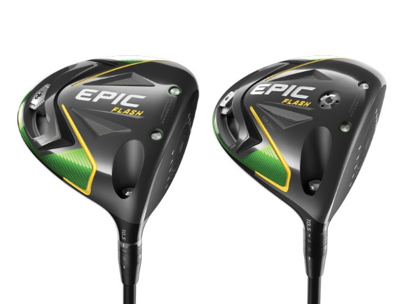 All clubs are available for club fitting by one of our friendly and knowledgeable PGA Professionals so let us help improve your game utilizing flight scope technology. Demos are also available. Remember, we won’t be beaten on Price!!! 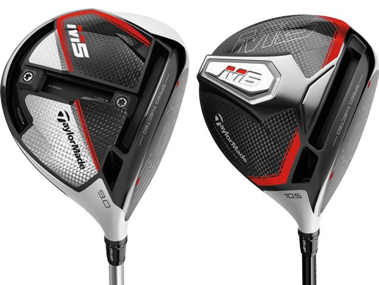 With the release of the new PING G410 range of drivers, fairway woods, hybrids and irons, the Cairns Golf Club will be hosting a fitting day on Thursday 18th April from 2pm - 5pm. 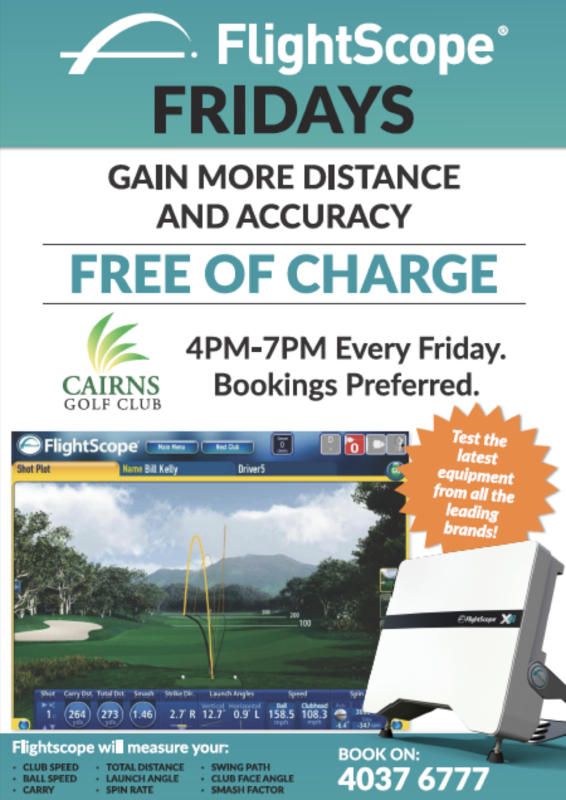 Come and get fitted by Lachlan Midson from PING for longer & straighter shots with the new range of product. Bookings limited so call 4037 6777 to reserve your time today!! The event is free of charge and no obligation. 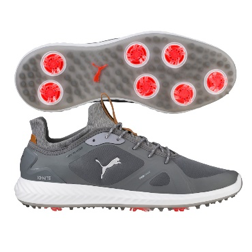 The new 2019 Under Armour range has arrived. 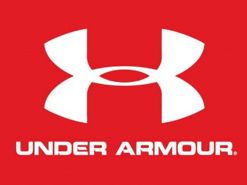 Under Armour have just launched the new season of shirts, shorts, belts, caps and shoes that come with a 2 year waterproof warranty. Come in store and check out this fantastic new range of product!! The new R & A Rules books are available from the golf shop free of charge. There are a number of changes in the rules and it is up to you to learn them. Just ask on of our friendly Professionals if you do have any questions. If you are mindful of managing a healthier diet it can be overwhelming sifting through all the products on the market to be sure you are choosing the best option for your body. This is true for food but also for nutritional supplements, powders and superfoods. Part of truly becoming healthy is looking past the marketing and learning how to read food labels and ingredients. It can be quite disappointing to find out that something you’ve been spending money on for a while isn’t as good for you as you thought or doesn’t provide anywhere near the benefit another brand would. A good place to start is finding a health store that stocks a limited well researched range of good wholesome brands. Choice and low price does not equal quality. At Calanna Wholehealth Pharmacy we do the research for you. It is our aim to stock quality food and supplement staples that genuinely contain the right ingredients for your Wholehealth and save you all that time sifting through labels. Our Naturopaths work tirelessly to keep on top of the best quality wholefoods and supplements not just on the market but available in our own backyard. If you can’t get to a Calanna store though here are some tips on what to look out for in products. Veganism is an emerging market in Australia. While it is important to seek out appropriate health advice before deciding whether a vegan diet is for you, if you have chosen to adopt a vegan lifestyle, it is wise to understand not all vegan products are equal. Some are in fact not that great for you, so ensure you read labels and talk to your local Naturopath or health advisor when deciding which products to stock in your cupboard. As a quick guide here are some tips from Calanna Wholehealth if you want to shop on quality and support local and Australian made. Mayvers is a popular nut butter brand on Instagram. Besides keeping their nut and seed butters clean they have wholesome flavoured nut butters like chocolate and coconut. Pureharvest has a range of different non-dairy milks like soy, almond, rice, oat and coconut. They use wholesome ingredients, whole soy beans and stay away from refined sugar and other artificial additives. Food Matters –They do lots of powdered blends designed for specific health purposes like detoxing or immunity and are high potency so you know you are getting your monies worth. Melrose Health – is an Australian brand that produces a large range of organic and non-organic oils. The brand offers many of the usual oils as well as some more interesting healthy oils like avocado, macadamia and almond oils. Kialla Pure Foods – Best known for its organic Australian stone ground wheat flour also sells various other wholegrain flours all using traditional stone milling and organic grains. 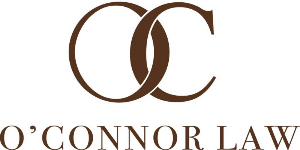 Honest to Goodness is a large Australian brand offering a variety of canned organic products as well as a large selection of other organic and natural foods. Most are BPA free. Natural evolution the highest grade and level of resistant starch in the world. Aside from resistant starch the company also have natural pro-biotic supplements as well as high fibre, gluten free green banana flour for baking. All the products sold have wonderful healing and cleansing effects on the digestion and encourage the body to balance out gut flora in a natural way. Lotus Foods is a high quality nutritional yeast with a great cheesy flavour that are a good source of B complex vitamins including vitamin B12. Barnes Naturals – offers Australian organic Apple cider vinegar with pure natural ingredients with no colours, flavours of preservatives. All vinegars contain beneficial bacteria, minerals and enzymes which are great for digestion and help support cleansing and detoxing. Most of these brands are stocked at Calanna Pharmacy so you can be sure that if you shop there you will be getting the best quality products available. 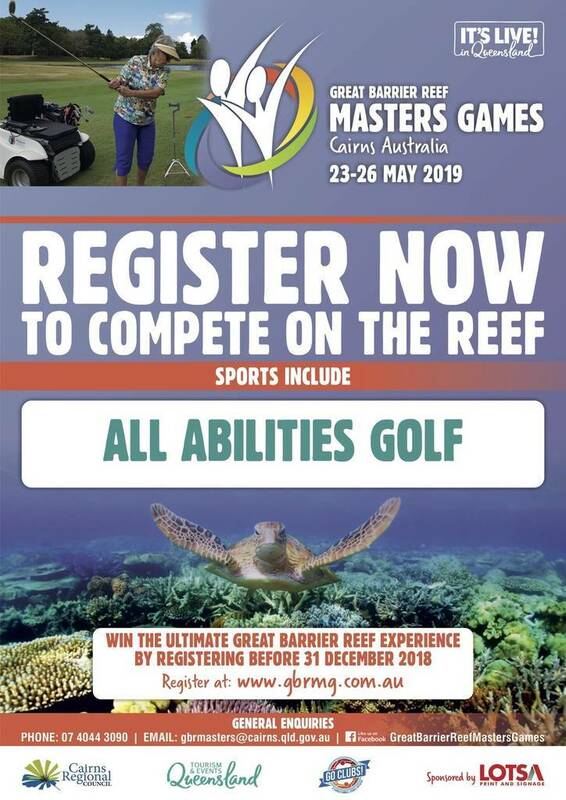 Copyright © 2019 Cairns Golf Club, All rights reserved. You are receiving this email as you (or the company that you work for) are subscribed to our mailing list. 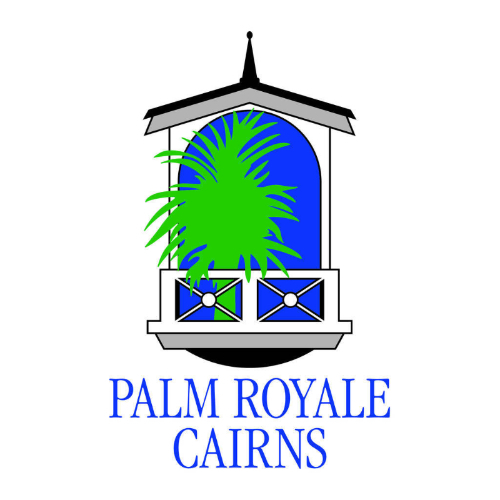 The Cairns Golf Club accepts no liability for any loss or damage arising as a result of the use of, or reliance on, the information contained in this email. Your privacy is important. 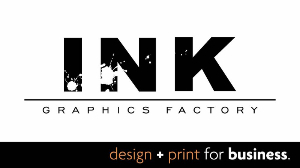 To ensure your edition is received every time, add us to your safe senders list.